We are located above Cove, in Union County Oregon. 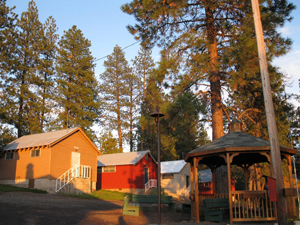 Nestled in the beautiful Blue Mountains of Eastern Oregon, the camp is about 3 hours NW of the Boise Idaho Metro areas and 3 hours east of Tri Cities Washington (Kennewick, Richland & Pasco)… a perfect destination & not far away. Whether you are planning a church camp or retreat, family reunion, wedding, scrap booking event, quilting, staff & business meeting, school field trip, company picnic, day camp, youth group camp or just a place to get away and relax, we can accomodate you!